Go to the nearest / most convenient 7-ELEVEN branch. Present Cignal SOA or accomplished Payment Slip to the cashier together with the payment. Acceptable mode of payment : CASH only. If Cignal TV Statement of Account is presented, the cashier issues a receipt and returns the upper portion of the SOA (customer's copy). Lower portion of the SOA is validated and retained by the Store. 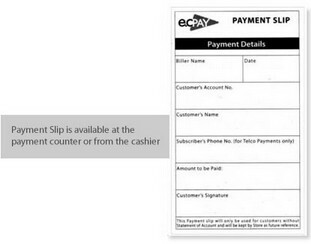 If Payment Slip is presented, the cashier issues a receipt and Payment Slip is retained by the Store. To ensure correct posting of payment, please verify the details indicated in the receipt before leaving the payment counter. Receipt serves as proof of payment.